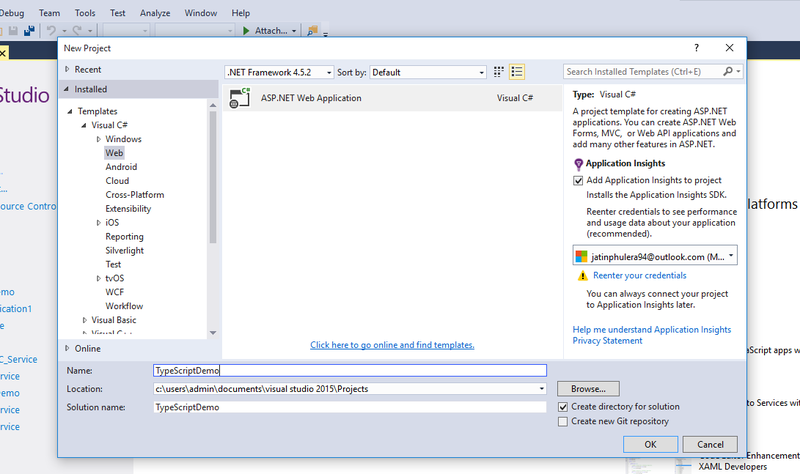 Open VisualStudio and Goto File =>> New ==>> Project And Give your Project a suitable Name. In my case Name is TypeScriptDemo. 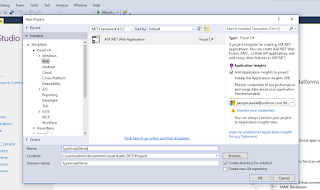 Now Goto SolutionExplorar ==>> Add ==>> TypeScript . And give this Typescript file a name and click OK.
Now define a class and ts properties just like you always done with C#. After run this page Output will be displayed in Alert message. First it will display alert(emp.EmpName) then Salary function will call and display alert("Salary Called") and in last after executing the salary function come back to the HTML and display Salary sum in alert. This is the Simple Class Property and Function example with Type Script . Now we discuss Inheritance concept with typeScript. When a class inherits or takes properties and features of other class ,it called Inheritance. We can use inheritance in TypeScript same like Object oriented Programming but a smaller change is that here it uses extends for Inheritance and in C# we used colon ( : ) for this. Now in HTML form call all the TypeScript class and methods .